This beautifully written and touching book offers up the belief that troubles will inevitably come into your life but those troubles won’t always stay with you. Good times will return and while the rainbow may not stay as long as you would like, there is beauty and hope in knowing that it will always come back to you. Stay calm when you find yourself in the midst of a crisis for these can became moments of rebirth. And rejoice, yes, rejoice, when the rainbow comes back to you. 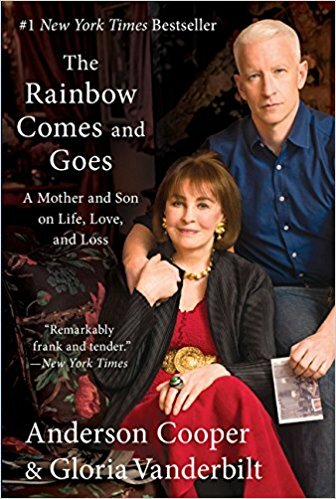 This insightful outlook on life comes from a mother and son who have been tested and inspired by various events in their colorful lives and in this book, which is written as a dialogue between the two, a precious bond is revealed and shared through sad and funny reflections. I remember watching CNN’s Anderson Cooper and his mother, Gloria Vanderbilt, a fashion designer known for her infamous jeans, being interviewed about this book when it was first published in 2016 but I had not yet read their book. While listening to them discuss on television the various tragedies in their lives, I was captivated by the way they both talked openly and honestly about how differently they felt about those personal losses. Now, having had the chance to finally read The Rainbow Comes & Goes, I found it poignant yet hopeful. Cooper and Vanderbilt lovingly reveal that no matter how much you think you know about someone important in your life, you can always learn more. Cooper and Vanderbilt show through the sharing of their personal insights that it is never too late to change your relationship with someone you care about. The idea for a book happened when Vanderbilt reached her nineties (she is now 94), Cooper began to wonder if he and his mother were as close as they could be. You might think this is an unusual thought for Cooper to have about his mom, especially when they have lived publicly through so many personal and tragic losses. Both are used to be in the public eye so I wondered what more there was for Cooper to learn about his mother. It turns out there is quite a lot. Cooper’s father and Vanderbilt’s husband, Wyatt Cooper, an American author and screenwriter, died in 1978, at the age of 50 during open heart surgery when Cooper was 10. Cooper’s brother, Carter, killed himself at the age of 23 by jumping from the terrace of a 14th floor penthouse in 1988. Cooper was 21 at the time of his brother’s horrendous death. Cooper and Vanderbilt were left in the wake of these sudden and tragic deaths as the two remaining members of their family. They found themselves mired in shock and grief yet they couldn’t help each other. They found themselves navigating their losses in very different ways. Vanderbilt couldn’t stop crying and wanted to talk incessantly about Carter and his death. Cooper withdrew from his mother and did not want to talk about it at all. Cooper and Vanderbilt find their way back to each other and continue to learn from each other’s differences in facing life’s troubles and triumphs. Their book is not all about serious incidents they have experienced and both reveal a sense of humor in unexpected ways. If you find your life has hit a bit of a rough patch, this book is reassuring. It confirms that other people’s lives are not as perfect as they may seem from the outside. All of us are handling some kind of emotional turmoil no matter how much money we have and whether we are famous or not. I thoroughly enjoyed reading The Rainbow Comes And Goes and found this book gave me perspective on sad or hard times that I have had in my life. Reading about some of the hard earned truths that both Cooper and Vanderbilt have learned along their life’s journeys made me feel hopeful about the rainbow coming to visit me again.